The SatSleeve for Android comes with an adaptor for Samsung Galaxy S4 inside the package. Adaptors for Samsung Galaxy S3 and S5 are available separately. Expand the horizons of your smartphone and use it in satellite mode whenever there is no terrestrial network available. Send and receive emails in satellite mode, no matter where you are. Access your favorite apps such as Facebook, WhatsApp, Twitter and many more, via satellite mode so that you can surf, chat and update your profile in places that are beyond terrestrial network reach. Add a reliable satellite connection to your Samsung Galaxy, wherever you go. The SatSleeve App is available as a free download from Google Play. Simply dock your smartphone into the SatSleeve to enjoy satellite connectivity. Available in 12 languages, the user-friendly SatSleeve App allows you to easily integrate your smartphone’s address book with the swipe of your fingertips. 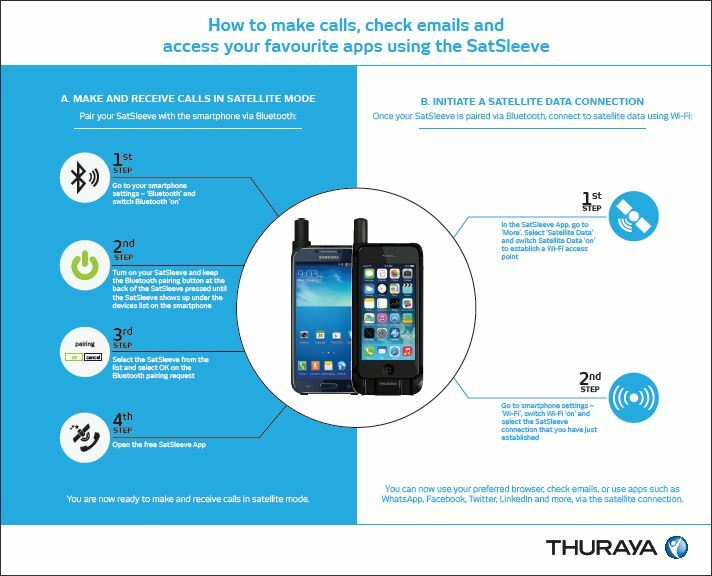 Thuraya SatSleeve comes equipped with an Emergency Call button - you can make a phone call to one predefined number even without your smartphone docked. Thuraya has developed a series of adaptors for different Samsung Galaxy models which allows you to switch between smartphones. The SatSleeve for Android comes with an adaptor for Samsung Galaxy S4 inside the package. Adaptors for Samsung Galaxy S3 and S5 are available separately. To increase the speed when loading websites, the SatSleeve for Android can be used with 3 different access points (APNs). Select either high compression (no images will be downloaded for fastest website loading), low compression (images will be compressed), or no compression (full website content will be loaded). Depending on your requirements, select the most suitable APN in the GmPRS settings on your Thuraya SatSleeve. Watch: SatSleeve. Now for Android. Thuraya Online Services – Acquire your satellite services with greater convenience! With Thuraya Online Services, you can log on to http://services.thuraya.com/ for a range of convenient services including checking your billing information for Prepay or Postpay accounts, and sending SMS messages online to other Thuraya handsets. Thuraya Solar Charger: Charge your Thuraya SatSleeve anytime and anywhere with our multi-functional portable solar charger. Download factsheet. Car ChargerCar Charger: Charge your Thuraya SatSleeve using standard 12V car cigarette lighter socket. Spare Battery: In case of any emergency, a fully-charged spare battery is the best accessory to have. Spare Travel Charger: Charge your SatSleeve almost anywhere in the world. Spare Adaptor for Samsung Galaxy S3: Changing your smartphone? No problem, just get a new smartphone adaptor for your SatSleeve! Spare Adaptor for Samsung Galaxy S4: Changing your smartphone? No problem, just get a new smartphone adaptor for your SatSleeve! Spare Adaptor for Samsung Galaxy S5: Changing your smartphone? No problem, just get a new smartphone adaptor for your SatSleeve!